Using unique mechanical experiments and close-up video, Cambridge researchers have shown how ants use microscopic ‘combs’ and ‘brushes’ to keep their antennae clean, which could have applications for developing cleaners for nanotechnology. For an insect, grooming is a serious business. If the incredibly sensitive hairs on their antennae get too dirty, they are unable to smell food, follow pheromone trails or communicate. So insects spend a significant proportion of their time just keeping themselves clean. Until now, however, no-one has really investigated the mechanics of how they actually go about this. In a study published in Open Science, Alexander Hackmann and colleagues from the Department of Zoology have undertaken the first biomechanical investigation of how ants use different types of hairs in their cleaning apparatus to clear away dirt from their antennae. “Insects have developed ingenious ways of cleaning very small, sensitive structures, so finding out exactly how they work could have fascinating applications for nanotechnology – where contamination of small things, especially electronic devices, is a big problem. Different insects have all kinds of different cleaning devices, but no-one has really looked at their mechanical function in detail before,” explains Hackmann. Camponotus rufifemur ants possess a specialised cleaning structure on their front legs that is actively used to groom their antennae. A notch and spur covered in different types of hairs form a cleaning device similar in shape to a tiny lobster claw. During a cleaning movement, the antenna is pulled through the device which clears away dirt particles using ‘bristles’, a ‘comb’ and a ‘brush’. To investigate how the different hairs work, Hackmann painstakingly constructed an experimental mechanism to mimic the ant’s movements and pull antennae through the cleaning structure under a powerful microscope. This allowed him to film the process in extreme close up and to measure the cleaning efficiency of the hairs using fluorescent particles. What he discovered was that the three clusters of hairs perform a different function in the cleaning process. The dirty antenna surface first comes into contact with the ‘bristles’ (shown in the image in red) which scratch away the largest particles. It is then drawn past the ‘comb’ (shown in the image in blue) which removes smaller particles that get trapped between the comb hairs. Finally, it is drawn through the ‘brush’ (shown in the image in green) which removes the smallest particles. “While the ‘bristles’ and the ‘comb’ scrape off larger particles mechanically, the ‘brush’ seems to attract smaller dirt particles from the antenna by adhesion,” says Hackmann, who works in the laboratory of Dr Walter Federle. Where the ‘bristles’ and ‘comb’ are rounded and fairly rigid, the ‘brush’ hairs are flat, bendy and covered in ridges – this increases the surface area for contact with the dirt particles, which stick to the hairs. 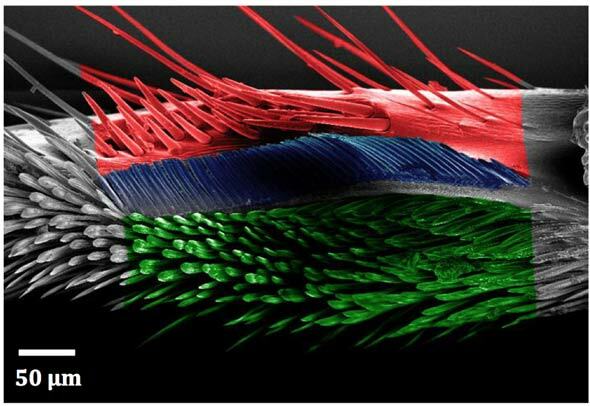 Researchers do not yet know what makes the ‘brush’ hairs sticky – whether it is due to electrostatic forces, sticky secretions, or a combination of factors. Dr Federle’s laboratory and, in part, this project receive financial support from the Biotechnology and Biological Sciences Research Council (BBSRC). 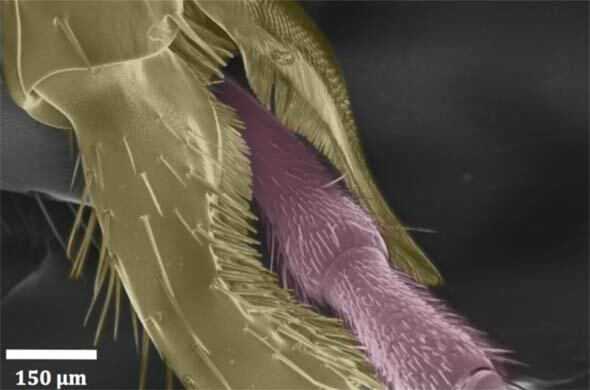 Inset images: Scanning electron micrograph of the antenna clamped by the cleaner (Alexander Hackmann); Scanning electron micrograph of the tarsal notch (Alexander Hackmann). Alexander Hackmann, Henry Delacave, Adam Robinson, David Labonte, Walter Federle. Functional morphology and efficiency of the antenna cleaner in Camponotus rufifemur ants. Open Science; 22 July 2015.